Early results of the second round of Guinea's presidential elections show that candidate Alpha Condé is leading his adversary Cellou Dalein Diallo in two of five communes in the capital Conakry and in another three cities, reports Info Plus Gabon. The head of the election commission, the Malian general, Siaka Toumany Sangaré, made public provisional results earlier this week. The leader of the Alliance Arc-en-Ciel, Alpha Condé, obtained 69,08 percent and 51,06 percent respectively in the in the communes of Kaloum and Dixim in Conakry, while Diallo managed only 30,91 percent and 48.24 percent in the same electoral districts. Condé also won in the three important towns of Fria, Coyah and Boffa with 51,28 percent, 60,43 percent and 67,73 percent respectively while his challenger won 48,74 percent39,26 percent and 32,27 percent in the same towns. In the Guinean diaspora, Diallo won most votes cast in 10 embassies abroad, while Alpha Condé won in only two embassies. The commission noted that voters' participation in the areas announced is estimated at between 52 and 72 percent and that results of other areas will be announced as soon as they are available. General Sangaré cautioned the public not to accept any results other than those announced by the commission. He also announced the arrest of four persons on Monday accused of distributing fictitious results. It will be recalled that in the first round held in June, Cellou Dalein Diallo won 43,60 percent of votes while Alpha Condé won 18,63 percent. 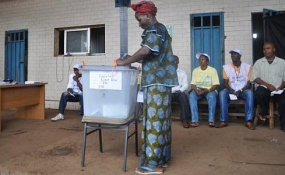 Radio France Internationale reports that Diallo's followers are already contesting the results and have asked the election commission to annul results in two towns – Siguiri and Kouroussa – believed to be Condé strongholds. Diallo campaign spokesman Fodé Oussou Fofana said the the absence of delegates from his party as a result of ethnic violence in October paved the way for fraud by Condé's followers – an allegation denied by Condé via his spokesperson, François Fall. The electoral commission has promised to investigate the allegations. Report compiled and translated by Michael Tantoh from the original French.